Western blot analysis of extracts from Jurkat cells, untreated or cytochrome c-treated (0.25 mg/ml), and HeLa cells, untreated, staurosporine-treated (1 µM), or cytochrome c-treated (0.25 mg/ml), using Cleaved Caspase-9 (Asp315) Antibody (Human Specific) (upper) or Caspase-9 Antibody (Human Specific) #9502 (lower). 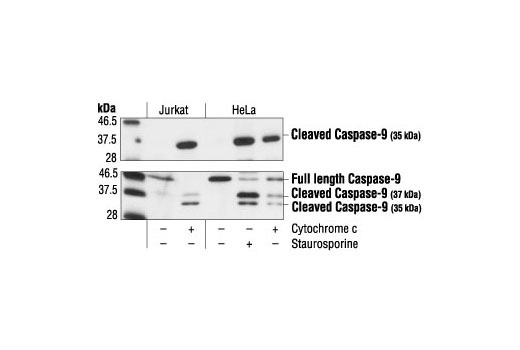 Cleaved Caspase-9 (Asp315) Antibody (Human Specific) detects endogenous levels of the 35 kDa large fragment of caspase-9 following cleavage at aspartic acid 315. The antibody does not react with full length caspase-9 or any other cleaved caspases. Polyclonal antibodies are produced by immunizing animals with a synthetic peptide corresponding to residues surrounding Asp315 of human caspase-9. Antibodies are purified by protein A and peptide affinity chromatography. Caspase-9 (ICE-LAP6, Mch6) is an important member of the cysteine aspartic acid protease (caspase) family (1,2). Upon apoptotic stimulation, cytochrome c released from mitochondria associates with the 47 kDa procaspase-9/Apaf-1. Apaf-1 mediated activation of caspase-9 involves intrinsic proteolytic processing resulting in cleavage at Asp315 and producing a p35 subunit. Another cleavage occurs at Asp330 producing a p37 subunit that can serve to amplify the apoptotic response (3-6). Cleaved caspase-9 further processes other caspase members, including caspase-3 and caspase-7, to initiate a caspase cascade, which leads to apoptosis (7-10). Duan, H. et al. (1996) J Biol Chem 271, 16720-4. Srinivasula, S.M. et al. (1996) J Biol Chem 271, 27099-106. Liu, X. et al. (1996) Cell 86, 147-57. Li, P. et al. (1997) Cell 91, 479-89. Zou, H. et al. (1999) J Biol Chem 274, 11549-56. Srinivasula, S.M. et al. (1998) Mol Cell 1, 949-57. Deveraux, Q. L. et al. (1998) EMBO J. 17, 2215-2223. Slee, E. A. et al. (1999) J. Cell Biol. 144, 281-292. Sun, X.M. et al. (1999) J Biol Chem 274, 5053-60. MacFarlane, M. et al. (1997) J. Cell Biol. 137, 469-479.